So I’ve been wanting to experiment with chickpea flour for several reasons: It’s inexpensive, nutritious, packed with fiber and protein & naturally gluten free. Each serving of chickpea flour packs a whopping 6g of protein and 5g fiber. SAY WHAT? It’s actually a protein goddess. You’d also be surprised to hear that the flour is naturally slightly sweet too, which means that it was easy to cut back on the sweeteners in the recipe. So where can you buy chickpea flour? Unfortunately it can be a little difficult to find if you don’t have a health foods store near you or a grocery store with a good gluten free section. You can also buy it online here. The good news is that chickpea flour isn’t difficult to make yourself, it’s just ground up dried chickpeas that are pulsed into a fine powder with the hard pieces sifted out. I’ve haven’t tried the DIY version yet, but want to! If you weren’t already aware, The United Nations declared 2016 the International Year of the Pulse, and I’ve committed to eating more pulses (beans, chickpeas, dried peas & lentils) by taking the Pulse Pledge. You’ve seen plenty of pulses on AK before, but I’m very excited to be incorporating them into my baking and cooking recipes as the year continues! They’re one of the most environmentally friendly crops in the world, using minimal water and a lower carbon footprint than almost any other food group. 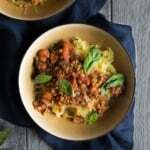 Pulses are one of the most cost-effective proteins around and tend to be very affordable. Pulses deliver high levels of potassium, magnesium, zinc, B vitamins and iron. They’re also high in fiber and beneficial in disease prevention. I made this bread and brought it to one of my favorite personal trainers, but didn’t tell him it was made with chickpea flour. He said the bread was amazing! Tony also ate several slices with peanut butter on top for dessert. He LOVED it and confirmed that it tasted exactly like regular banana bread. Having a boyfriend who will try anything is truly a blessing. Hope you guys love this bread as much as I do. If you make it be sure to tag #ambitiouskitchen on Instagram or leave a comment below! Have you ever tried chickpea flour?! Here's your chance! 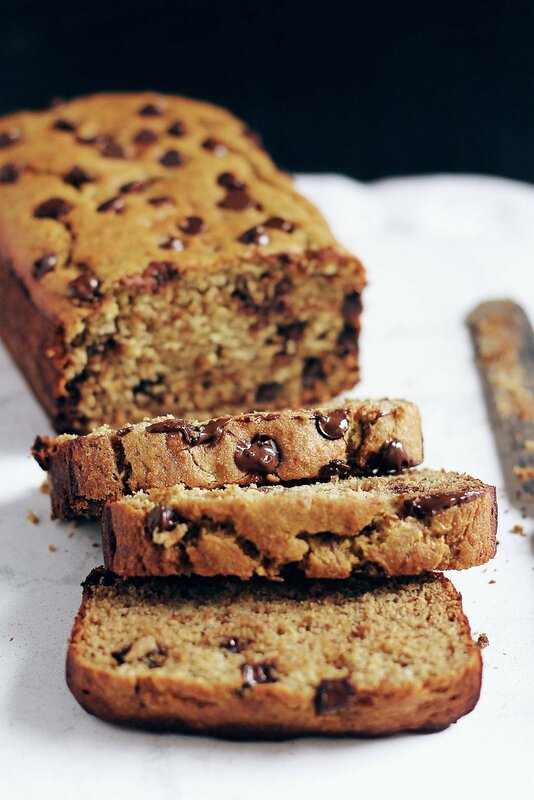 Try this beautiful chickpea flour banana bread packed with protein & fiber. You can't tell that it isn't made with regular flour! *Nutrition information is based on banana bread only, without additional add ins. You can also bake this into muffins, adjust the baking time to 20-24 minutes. This post was sponsored by USA Pulses & Pulse Canada. All opinions and thoughts are my own. Thanks for continuing to support AK and the brands that help make this site possible! 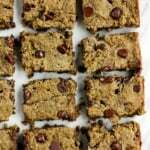 93 Responses to "Chickpea Flour Banana Bread (gluten free!)" Yasssss finally a banana bread recipe with chickpea flour! This looks amazing as always Monique! 🙂 My boyfriend will try anything too, they’re men. Haha! This looks incredible – I cannot wait to try chickpea flour! I just made your paleo coconut flour banana bread on Monday and I only have one slice left. O_O oops! It’s SO good. Mmmm all those melty chocolate chips on top look like a dream. I want this in my life right now!!! Miss you! I was so hesitant on chickpea flour at first. I would think the flavor is strongly beany and dense. However, I’ve been wanting to try it as an egg replacer for a while and I think I should try it very very soon! Looks great. Should this equal out to about one cup mashed banana? I’m definitely going to make this! Looks so good and healthy. I’ve actually made my own chickpea flour and it’s very easy. I have a vita mix and I just pulsed it there. It took less than a minute and then I just ran it through a mesh strainer. I used the flour to make dosas which are amazing (Kind of like an Indian version of a tortilla). Dried chickpeas are so cheap too and so easy to find. Thank you!!! This is one beautiful loaf!! Chickpea flour is seriously the best. I love making chickpea flour tortillas and loading them with alllll the delicious Mexican toppings. I definitely want to try this with flax eggs! i used flax eggs and it came out really good! I would love to know how to make your gluten free flour tortilla’s! My son really misses being able to eat soft taco’s and enchilada’s. He says its just not the same when I use corn tortilla’s and he has wheat allergies. Do you think this recipe would work in muffin form as well? I’d love to try, I have some chickpea flour I need to use up! ? I’ve never used chickpea flour, and literally went onto Thrive Market and bought some after seeing your snap about this post LOL I am so interested in trying! Especially after seeing this beaut. Tried this today and it was absolutely delicious ! I substituted the coconut oil with olive oil since I had no coconut oil and it turned out really well still 🙂 added macadamia nuts into the batter and followed the recipe to a tee! Tasted really good plus felt guilt free too , just the right amount of sweetness and moisture .. Thank you ! 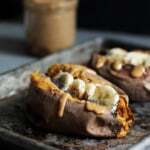 Love this recipe and the pics make it look soooooo tasty!! I so might have to try this recipe due to the fact I have been making the most scrumptious cookies from chickpeas in the can! Too good! Also awesome that you met Bobby Flay my husband and I have recently started watching worst cooks in america and that guy is awesome! This looks delicious!! I’ve never tried chickpea flour but I think I’m gonna have to. 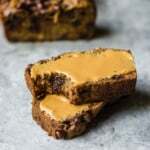 I also love to eat my banana bread with peanut butter on top! 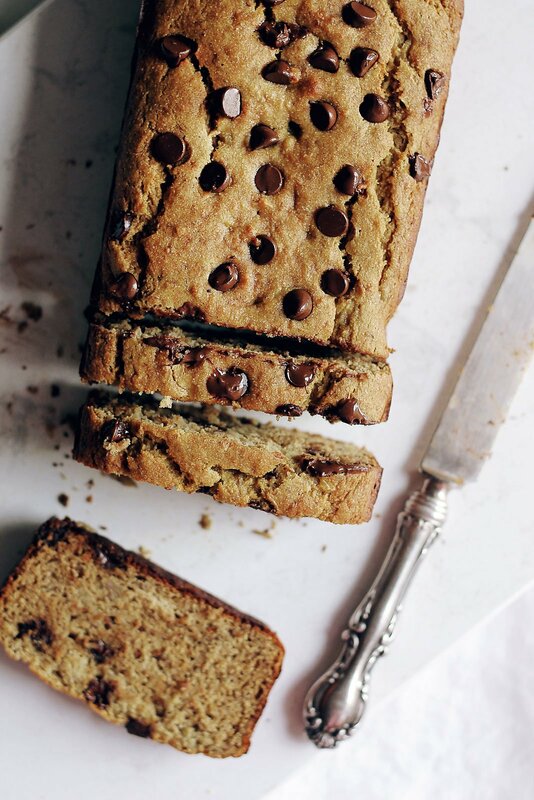 I LOVE chickpea flour and I bet it tasted wonderful in this banana bread. Which by the way makes me sad that I don’t have any of this for breakfast. I’m so hungry but the desire to cook is zero…haha. Mine turned out dry and flavorless. I’d like to try making this again but I’d probably add more banana and/or oil. Hi Laila! I’m sorry to hear that. I’ve made this 4 times now and it’s been amazing for me. Did you make any changes? Also, were your bananas extra ripe? I’ve seen a few people make this on Instagram and tell me they’ve loved it so I’m wondering if maybe you overbaked it or used different ingredients. Let me know! I didn’t make any changes. The only thing I can think is that my banana were on the small side? I’ve seen some folks say they’ve added a touch of yogurt for moistness…just a thought. This. Was. Perfection! Turned out amazing, thank you so much!! The texture is suprisingly perfect! Mine turned out awesome, cannot belive its garbanzo flour. Genius. I baked this up and used shredded coconut and it was incredible!! perfect flavor and texture..oh! I also baked it up in mini bread pans and was able to get 7 out of the recipe..popped most in the freezer to have on hand as quick snacks for us. Thank you so much for the recipe. I love using chickpea flour where ever possible! My family doesn’t love coconut, what would you suggest a substitute? I have all of the other ingredients and can’t wait to make it! You can make it without coconut, it says it’s optional. As for the oil: Feel free to use olive oil or butter instead. This recipe looks delicious, can’t wait to try it! I have almost all the ingredients in my pantry except for the apple cider vinegar. Is it necessary? Would you be able to substitute white vinegar instead? Thanks in advance! So being as I’ve worked at pulse cleaning plants for the last 10 years and I deal with chickpeas every day…. I figured I kind of have to try this recipe. They’re quite good! They taste like a good healthy muffin (I made muffins) but you would never guess it’s chickpea flour! Thanks for the recipe! This is banana bread. Blueberries are listed under OPTIONAL. You don’t have to use them. I have been GF for 2 yrs now and have tried many banana bread recipies, most I have to throw out, cause they are just so far from the real thing. (As I knew it). This recipie was very good and my first reaction was “this taste just like my banana bread used to taste”. I added half a cup of shredded coconut and a cup of walnut pieces. Thankfully my search is over, I love that it’s grain free and I am looking forward to trying other recipies with chickpea flour. Hey there! I was just wondering, what brand of chickpea flour do you use? The flour I have on hand tastes quite bitter, and I was wondering if I could find a better suited chickpea flour. Thanks so much! Just tried this today. 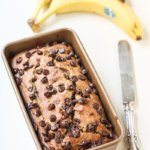 After making traditional banana bread last week that was just ok, I found this recipe on Pintrest. Made it this morning and the boyfriend was hovering while it cooled down. It turned out fabulous! We both like it more than the flour banana bread. I added some dairy free chocolate chips for sweetness. I did have to cook it for close to an hour but my oven is wonky. Thanks! Wow. So I made the base recipe without any add ins that you listed, and added one extra banana, 2-3 tbsp coconut flour, a little extra baking soda (I didn’t measure) and 1 tbsp tapioca starch. They turned out GREAT. 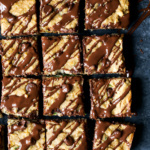 I will definitely make these again! This turned out very dry. I omitted chocolate chips so my toddler could have it. No other changes. Hmmm. Any ideas? Thank you! Hello! Is there a substitute for the two eggs? Perhaps flax eggs? We made it today! I had promised baking to the three year old, then discovered we were out of all-purpose flour. We had chickpea flour on hand, which is why I googled and ended up here. We made mini muffins, and ate half of them straight out of the oven. I actually remember my mother cooking a chickpea flour dessert and assumed this would resemble that. It didn’t. 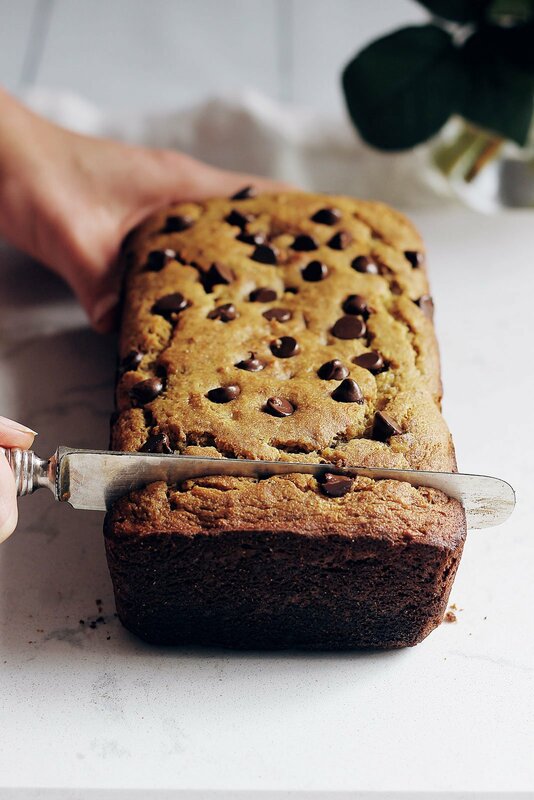 Just plain delicious banana bread. My two- year old gluten sensitive (that’s ALL grains) and food allergy prone little one loves this bread and even my older non-banana loving sweetie loves this bread. Thanks so much for the recipe! Just to say thank you for this amazing recipe! My 18-month old loves it! I have sometimes had issues with chickpea flour tasting bitter, but I put the flour in the oven on a baking tray for 15 minutes (stirring once or twice and opening oven door to let out the smell! ), and the cake did not taste bitter at all. Just made this for the first time today. Wow! I’ve had to cut most grains out of my diet as a result of my sons allergies, and have been searching for a good banana bread recipe. This one does the trick! My husband Had no idea and raved about it. Thanks for posting 🙂 I’ve experimented with a bunch of alternative flours but never chickpea. I will be from now on! Had to come back and thank you for posting this! I am six months pregnant, and craving sweets and breads! This was perfect! Amazing recipe. I made this over the weekend and I loved it! I was out of cinnamon, so I had to use apple spice blend. I also added dairy-free chocolate chips and walnuts. You don’t even miss the flour or sugar! Can’t even tell the difference, which is what I hoped for. I’ll be making this quite often. Thank you! I just made this banana bread and I was so surprised at how well it turned out. The bread is moist and soft. Thanks for the recipe. I followed it as it is and added 1/2 cup of chocolate chips. I did sieve the chikpea flour twice. Sounds amazing. I can’t have vinegar though. Can I leave it out & use baking powder instead of the baking soda? What I said the purpose of the vinegar? Looking for to trying it. Hey Monique!! First of all, thank you so much for this recipe! It genuinely doesn’t taste like chickpeas at all! I need your help though: the top and bottom of my bread seem to taste a little burnt, but the inside doesn’t taste too dry, like I overbaked it or anything. But maybe I just left it in the oven too long? I left it in for exactly 46 minutes, so I don’t think it would be too burnt because of that! I also don’t think I’ve ever made a banana bread where the bottom tasted burnt, it’s usually just the top that gets too brown. I took it out after 46 minutes and turned the oven off and put some foil on top to keep the top from getting too dark. But if you have any tips, please help! I am making this bread for a friend soon and I want to make sure it’s perfect for her! Thank you so much! Hi Elise! I’m so glad you enjoyed this! As for the burnt part – I would double check and make sure you sprayed your pan well before pouring in the ingredients. I’ve never experienced the burnt taste, so that might be the culprit! I just made muffins, used mini chocolate chips…..DELICIOUS! Mini chocolate chips are the BEST! Glad you enjoyed! I’m in the process of making this banana bread, just waiting for it to come out of the oven, but I’m a little skeptical as the batter tasted strongly of a raw chickpea flavour, and also bitter. I saw one commenter baked her flour in the oven first before making the recipe. I might have to try that if this one fails. Yes! Love it. So glad you enjoyed! At last a gluten free loaf that is tasty and has great texture! I’ve been looking for something like this for about 40 years. All the other recipes I’ve tried were not tasty at all. Love this one!! I’m so glad this one was a winner for you! i’ve made this with flax egg and its very nice, surprisingly sweet enough, very nice texture but a bit dry, i might have overbacked it, i might try to add more wet ingredients for the next one, definitely making it again, it seems more natural then using a gluten free flour blend for example where you have to put xantan gum…its simple,,just chickpeas flour. I made muffins and they came out perfectly. I actually googled a banana bread with chick pea flour and found this. Am g/free anyway, but trying to use much less flours. I made this last night and added walnuts and raspberries. Made them into muffins and they’re DELICIOUS!! This was excellent. 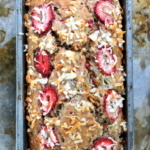 I used a 9″x5″ loaf pan and added Trader Joe’s chocolate chips, chopped walnuts, and flaked coconut. It baked up with a surprisingly light crumb. Thank you for the recipe. Perfect!! Glad you loved this one! I made these into muffins & like a few other reviews, my turned out very dry as well. Also, would prefer them a bit sweeter. Will maybe use this as a base recipe & tweak a few things next time. I would be sure your bananas are super ripe to help with both the moisture and the sweetness. You might also want to adjust the baking time a bit for muffins! These are amazing! I made mini muffins, added one more banana to keep them moist and chocolate chips. Family loved them, and without nuts they are a great school safe snack! So happy to hear that! Perfect snack. Made this loaf with dark chocolate chunks and it was awesome! Although I love chickpea flour in savoury dishes, sometimes I think it tastes too “beany” but not this time. This recipe’s definitely going into rotation. Thanks, Monique! I made the muffin version, and they are freaking amazing. Perfectly moist and sweet (but cake-level sweet, like some banana bread is), didn’t stick to my non nonstick pan at all, and taste nothing like chickpea flour. I’m impressed. 100% making them again. Thanks for the wonderful recipe! So happy to hear that! 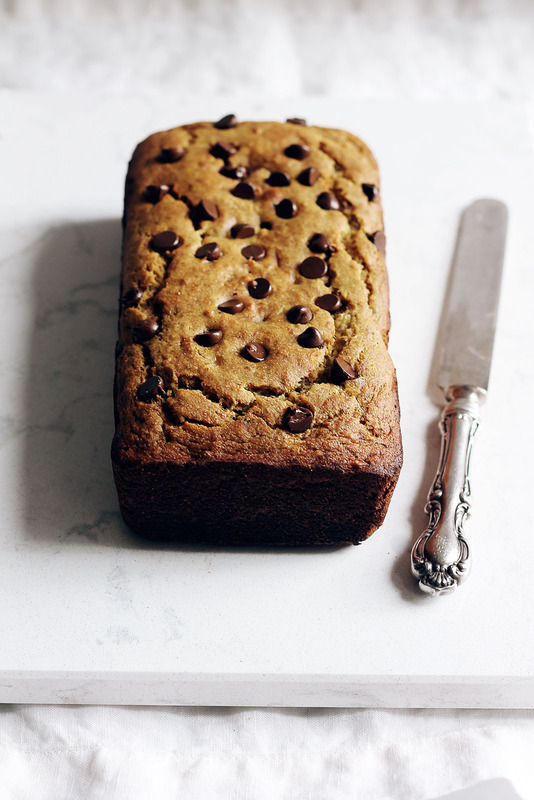 This is one of my go-to gluten free banana breads. Maybe one of the best banana breads I’ve made so far! And you can’t task the chickpea flour at all. I veganized this and it turned out awesome. To make vegan: instead of eggs use two flax eggs (2 Tbsp ground flax seeds mixed with 6 Tbsp water) and instead of honey I used rice syrup. Definitely making this again. Thanks Monique! So happy to hear that! And glad those vegan swaps worked out. One of my fav breads! Chickpea flour is my new go to gf flour. I made 12 muffins from this recipe and Wow the texture of the muffins taste like the real deal it’s amazingly light and fluffy! Isn’t it amazing?? I love baking with it!